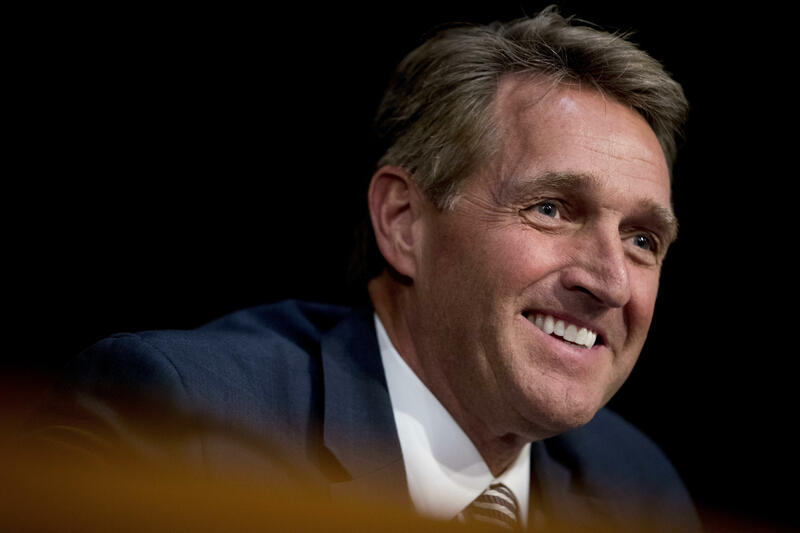 Transcript: Sen. Jeff Flake's speaks about the dangers of calling facts "fake news"
Arizona Senator Jeff Flake gave a speech on the Senate floor Wednesday, delivering his message to President Trump that assaults on the media and freedom of speech have the potential to cause damage beyond America's borders. The speech comes on the same day that Mr. Trump says he will announce a set of "Fake News Awards," addressing what he sees as bias in the mainstream media. The full transcript of Senator Flake's comments, as prepared for delivery, appear below. Mr. President, near the beginning of the document that made us free, our Declaration of Independence, Thomas Jefferson wrote: "We hold these truths to be self-evident..." So, from our very beginnings, our freedom has been predicated on truth. The founders were visionary in this regard, understanding well that good faith and shared facts between the governed and the government would be the very basis of this ongoing idea of America. As the distinguished former member of this body, Daniel Patrick Moynihan of New York, famously said: "Everyone is entitled to his own opinion, but not to his own facts." During the past year, I am alarmed to say that Senator Moynihan's proposition has likely been tested more severely than at any time in our history. 2017 was a year which saw the truth -- objective, empirical, evidence-based truth -- more battered and abused than any other in the history of our country, at the hands of the most powerful figure in our government. It was a year which saw the White House enshrine "alternative facts" into the American lexicon, as justification for what used to be known simply as good old-fashioned falsehoods. It was the year in which an unrelenting daily assault on the constitutionally-protected free press was launched by that same White House, an assault that is as unprecedented as it is unwarranted. "The enemy of the people," was what the president of the United States called the free press in 2017. Mr. President, it is a testament to the condition of our democracy that our own president uses words infamously spoken by Josef Stalin to describe his enemies. It bears noting that so fraught with malice was the phrase "enemy of the people," that even Nikita Khrushchev forbade its use, telling the Soviet Communist Party that the phrase had been introduced by Stalin for the purpose of "annihilating such individuals" who disagreed with the supreme leader. This alone should be a source of great shame for us in this body, especially for those of us in the president's party. For they are shameful, repulsive statements. And, of course, the president has it precisely backward -- despotism is the enemy of the people. The free press is the despot's enemy, which makes the free press the guardian of democracy. When a figure in power reflexively calls any press that doesn't suit him "fake news," it is that person who should be the figure of suspicion, not the press. I dare say that anyone who has the privilege and awesome responsibility to serve in this chamber knows that these reflexive slurs of "fake news" are dubious, at best. Those of us who travel overseas, especially to war zones and other troubled areas around the globe, encounter members of U.S. based media who risk their lives, and sometimes lose their lives, reporting on the truth. To dismiss their work as fake news is an affront to their commitment and their sacrifice. According to the International Federation of Journalists, 80 journalists were killed in 2017, and a new report from the Committee to Protect Journalists documents that the number of journalists imprisoned around the world has reached 262, which is a new record. This total includes 21 reporters who are being held on "false news" charges. Mr. President, so powerful is the presidency that the damage done by the sustained attack on the truth will not be confined to the president's time in office. Here in America, we do not pay obeisance to the powerful -- in fact, we question the powerful most ardently -- to do so is our birthright and a requirement of our citizenship -- and so, we know well that no matter how powerful, no president will ever have dominion over objective reality. Of course, a major difference between politicians and the free press is that the press usually corrects itself when it gets something wrong. Politicians don't. No longer can we compound attacks on truth with our silent acquiescence. No longer can we turn a blind eye or a deaf ear to these assaults on our institutions. And Mr. President, an American president who cannot take criticism -- who must constantly deflect and distort and distract -- who must find someone else to blame -- is charting a very dangerous path. And a Congress that fails to act as a check on the president adds to the danger. Now, we are told via twitter that today the president intends to announce his choice for the "most corrupt and dishonest" media awards. It beggars belief that an American president would engage in such a spectacle. But here we are. It is not my purpose here to inventory all of the official untruths of the past year. But a brief survey is in order. Some untruths are trivial -- such as the bizarre contention regarding the crowd size at last year's inaugural. But many untruths are not at all trivial -- such as the seminal untruth of the president's political career - the oft-repeated conspiracy about the birthplace of President Obama. Also not trivial are the equally pernicious fantasies about rigged elections and massive voter fraud, which are as destructive as they are inaccurate -- to the effort to undermine confidence in the federal courts, federal law enforcement, the intelligence community and the free press, to perhaps the most vexing untruth of all -- the supposed "hoax" at the heart of special counsel Robert Mueller's Russia investigation. To be very clear, to call the Russia matter a "hoax" -- as the president has many times -- is a falsehood. We know that the attacks orchestrated by the Russian government during the election were real and constitute a grave threat to both American sovereignty and to our national security. It is in the interest of every American to get to the bottom of this matter, wherever the investigation leads. Ignoring or denying the truth about hostile Russian intentions toward the United States leaves us vulnerable to further attacks. We are told by our intelligence agencies that those attacks are ongoing, yet it has recently been reported that there has not been a single cabinet-level meeting regarding Russian interference and how to defend America against these attacks. Not one. What might seem like a casual and routine untruth -- so casual and routine that it has by now become the white noise of Washington - is in fact a serious lapse in the defense of our country. "In February…Syrian President Bashar Assad brushed off an Amnesty International report that some 13,000 people had been killed at one of his military prisons by saying, "You can forge anything these days, we are living in a fake news era." In the Philippines, President Rodrigo Duterte has complained of being "demonized" by "fake news." Last month, the report continues, with our President, quote "laughing by his side" Duterte called reporters "spies." In July, Venezuelan President Nicolas Maduro complained to the Russian propaganda outlet, that the world media had "spread lots of false versions, lots of lies" about his country, adding, "This is what we call 'fake news' today, isn't it?" "A state official in Myanmar recently said, "There is no such thing as Rohingya. It is fake news," referring to the persecuted ethnic group. Leaders in Singapore, a country known for restricting free speech, have promised "fake news" legislation in the new year." In our own country, from the trivial to the truly dangerous, it is the range and regularity of the untruths we see that should be cause for profound alarm, and spur to action. Add to that the by-now predictable habit of calling true things false, and false things true, and we have a recipe for disaster. As George Orwell warned, "The further a society drifts from the truth, the more it will hate those who speak it." Any of us who have spent time in public life have endured news coverage we felt was jaded or unfair. But in our positions, to employ even idle threats to use laws or regulations to stifle criticism is corrosive to our democratic institutions. Simply put: it is the press's obligation to uncover the truth about power. It is the people's right to criticize their government. And it is our job to take it. We are a mature democracy -- it is well past time that we stop excusing or ignoring -- or worse, endorsing -- these attacks on the truth. For if we compromise the truth for the sake of our politics, we are lost. Eternal ... unchanged ... evermore."